The German Fraunhofer Institute for Reliability and Microintegration recently reported the development of a camera with a lens attached that is 1 x 1 x 1.5 millimeters in size, which is the size of a grain of salt. At about a cubic millimeter in size, this camera is right at the size limit that the human eye can see unaided. The camera not only produces decent images but it is also very cheap to manufacture…so cheap in fact that it is considered disposable. 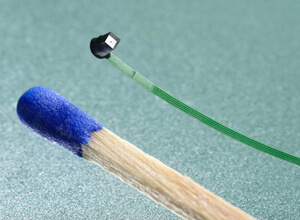 New Disposable, Medical Camera Is the Size of a Grain of Salt | Singularity Hub. ← EU Votes on copyright extension soon – mail your local JURI MEP today!